Brewed and bottled by Jolly Pumpkin Artisan Ales, Dexter, Michigan. 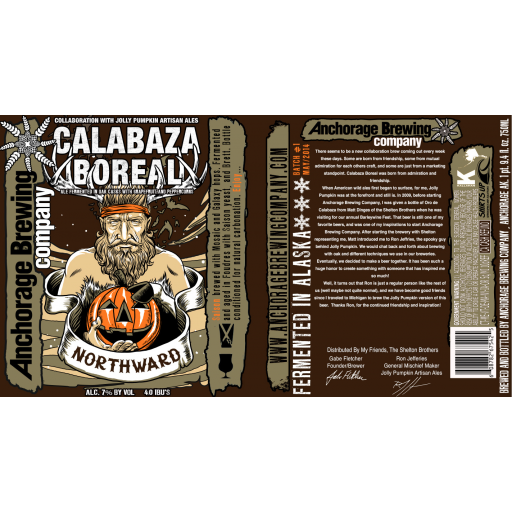 A collaboration with Anchorage Brewing Company, this ale is brewed with grapefruit peel, juice, and peppercorns. Oak barrel aged and bottle conditioned. He who fights with monsters should look to it that he himself does not become a monster. And when you gaze long into an abyss the abyss also gazes into you. Nietzsche When introspection fails, it's time to look outward for inspiration, perhaps Northward! One of the people who inspired me this past year is my friend Gabe Fletcher of Anchorage Brewing Co. We brewed this beer together. I hope it inspires you. Northward!